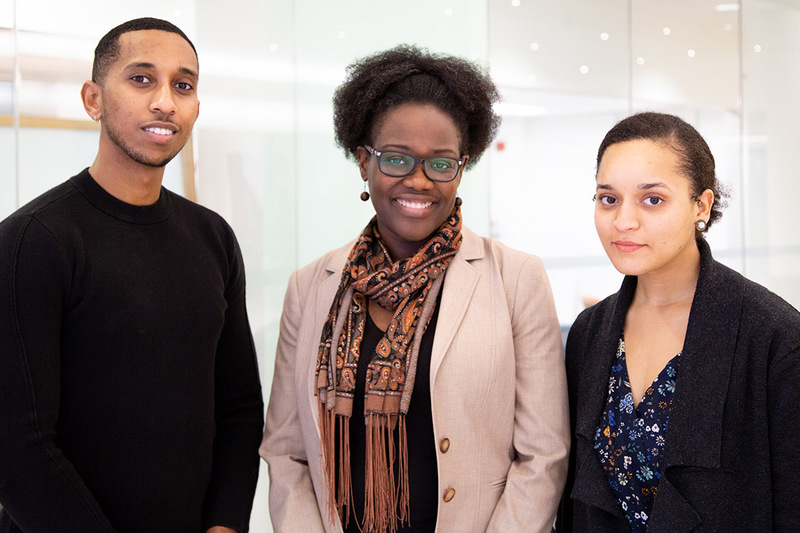 The Faculty of Medicine’s Black Student Application Program (BSAP), which began in 2017, provides a more culturally safe admission pathway for Black students to medical school. Modelled on a similar pathway for Indigenous students, BSAP welcomed its first cohort in September. Now, after one term in U of T’s MD program, Faculty of Medicine writer Liam Mitchell spoke with two students who participated in BSAP – Chantal Phillips and Semir Bulle – to discuss their experiences and reflections on why BSAP matters. What inspired your interest in medicine? Chantal Phillips: My mother was a personal support worker (PSW) throughout my childhood and it was clear how much she cared for her patients. Having her as an example of what an empathetic health-care provider looked like gave me insight and sparked my desire to emulate that in my own career. At the systemic level, my interest in addressing health disparities in the Black community was a major propelling factor. Overall, I knew being a doctor would help merge my desire to positively and directly impact lives, while also influencing social systems that have downstream effects on the morbidity and mortality of Black Canadians. Semir Bulle: Growing up in the Dixon-Rexdale area, the majority of people in my community were newly landed immigrants and refugees. I’ve witnessed countless situations in which people wouldn’t go to the doctor because they felt the doctor wouldn’t properly understand them and worried the recommended course of action would be unaffordable. When you live paycheque to paycheque, being sick can be the straw that breaks the camel’s back and I just don’t think that’s fair in our society. That, coupled with my experiences serving in the hospitals in rural Ethiopia, has shaped my view on life and the intersection of health care and policy work. Do you have a sense of what type of medicine you want to practise? Chantal Phillips: Throughout the first four months of medical school, I was certain I wanted to be a public health physician. Many of the physicians I look up to prioritize the role of public health in their careers and I assumed that would be the best way to express my passion for advocacy. However, through more recent experiences shadowing, I’ve started to challenge that notion. Public health can be incorporated into practically any specialty and the social determinants of health play a pivotal role for all patients. With that being said, I’m back to square one and excited to further explore additional specialties. Semir Bulle: Right now, I’m definitely leaning towards surgery. I enjoy the hands-on nature of the work and the intricacies of the human body interest me. However, I’ll certainly pursue policy work and political avenues, too, since I believe that’s where the true impact is when it comes to overall change. Did you know many Black health-care professionals before applying to med school? Chantal Phillips: Absolutely none. I’m the first in my family to get a degree and I had no role models or mentors on my path to medicine, which is essential to increasing representation. When you grow up not knowing or seeing a single doctor of colour, but most of the underpaid support staff are people of colour, it makes you question why things are the way they are. Semir Bulle: Most of the Black health-care professionals I encountered were PSWs or nurses. I’d never been treated by a Black physician, despite living in Toronto and then Brampton, which have substantial Black populations. Why do you think Black students have been under-represented in medicine? Chantal Phillips: The nature of privilege and education is multifaceted. Getting into medical school doesn’t start with the application cycle. It starts the moment we’re born and become learners. Black communities experience higher rates of poverty, which influences access to educational resources. Semir Bulle: In Toronto, the average low-income family makes $32,000 before taxes. Black people are only eight per cent of the city’s population but make up 13 per cent of its poor. Compare that to the three per cent of Black individuals considered ‘high-income’ at $102,000 annually. As David Hulchanski, a social work professor here at U of T, said: “Money buys choice, and people with the most choice are going to choose to live in certain areas.” This contributes to racial disparities in our neighbourhoods and different standards of life for these people. Chantal Phillips: Children from families of higher socioeconomic status typically have parents with the means to support educational activities. Academic summer camps, time at the library, tutors and early mentorship are examples of privileges that establish a foundation for learning and advancement. Furthermore, underrepresentation is cyclical. When you don’t see people who look like you represented in a particular field, especially a competitive one, it can have a negative impact on your self-image and self-efficacy. How did BSAP help you get to know U of T Medicine better, and help U of T Medicine get to know you better? Semir Bulle: This is the first time I’ve had a group of Black peers in university. I went to McMaster and had a diverse friend group, but the lack of Black people was always apparent, especially in science. BSAP gave me a sense of community and that my academic experiences were similar to others. Chantal Phillips: BSAP reinforces the advocacy, diversity and inclusion outlined in the U of T Medicine strategic plan. It’s one thing to read a strategic plan and another to see measurable action of these documents. Investing in this stream to address an evident disparity emphasized the authenticity of these claims. Applying through the BSAP stream also allowed me to more genuinely speak about my involvement in the Black community. I was confident these initiatives would be appreciated for their full value, considering there were Black community members reviewing the applications. Semir Bulle: U of T has done a good job of supporting us, which allows us to be free to learn how to become doctors while still serving the communities we come from and adore. How was your experience during the first term of the MD Program? Chantal Phillips: My initial transition to medical school wasn’t easy. Uprooting and rebuilding your home, academic standing, social circle and community initiatives would be tumultuous for practically anyone. I got really sick at the beginning of flu season because of how much stress I was putting myself under. It was a wake-up call and made me realize I needed to alter what I was doing. I decided to prioritize my wellness and growth. Since then, I’ve been much happier and better integrated. I’m excited to be here and meeting so many amazing people. This might be the honeymoon phase, but I hope it persists and I continue enjoying learning as much as I do now. Semir Bulle: I’ve had some of the best times of my life. Everyone has been friendly and there’s a real sense of community. I know most of the people in my class and we get to socialize frequently while getting some of the best education in the world, so there’s really nothing to complain about right now. What would you say to a Black student considering studying medicine at U of T? Semir Bulle: Do your research and look into what you have to do from the second you walk into university. Reach out to as many people as you can and put yourself out there, which is something I never did. It’s going to be a hard road but with sacrifice and a little luck, anything is possible. Also, reach out to us at the Black Medical Students’ Association (BMSA) – we’d give advice if you need it. Chantal Phillips: BSAP has set a precedent for what an inclusive, advocacy-oriented medical school looks like. Black students are becoming better represented here, there are Black faculty members and social justice is discussed throughout the curriculum. If you’re intimidated by the application process, want to build a network or seek mentorship, please connect with Ike Okafor who facilitates the Community of Support. Mentorship and preparation are key to a successful medical school application. I can speak on behalf of the other Black medical students and say that we’d love for you to be a part of this community.